As the leaves change colors, we prepare for another season which brings much joy to our children. Fall is filled with festivals, football, apple picking and the much anticipated Halloween night. Activities help a child learn about new topics in an enjoyable environment and projects are a wonderful way to reinforce what has been learned in a format that goes beyond a piece of paper and pencil. 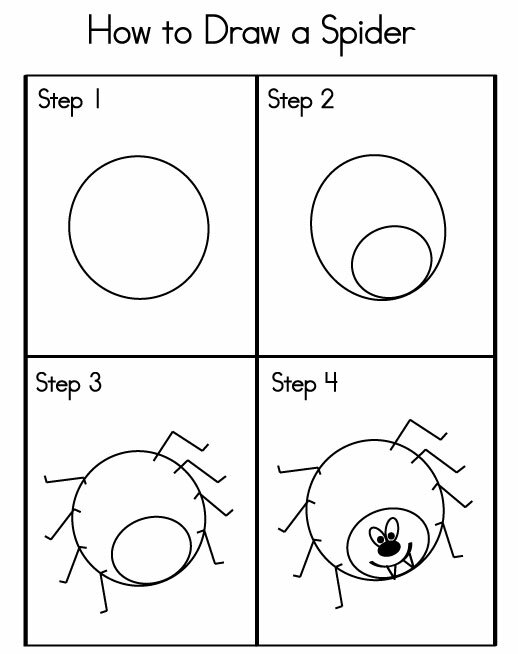 Using a spider theme, below please find an activity and project that are ideal for a child in the primary grades. This activity is ideal for a child in kindergarten or first grade. We offer another activity below that is more suitable for a child in second grade. Did you know there are over 30,000 different spiders? Spiders vary in color and size but they all have eight legs, spin silk and have killer fangs. The activities below can be completed in school when a child finishes their work or at home to decorate the house. The following activity can be used to make place mats or for a picture to hang on the wall. If I can draw this, anyone can! After you complete this activity, review some basic spider facts. Most spiders have eight legs. Did you draw eight legs? Spiders have fangs. Did you draw fangs? Spiders spin silk. Where do you think the spider spins silk? My daughter just completed her second grade spider project. She constructed a spider model and placed it in an environment it is normally found. 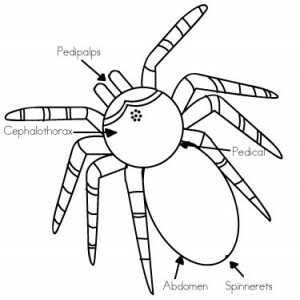 After making the spider, consider discussing the following parts of a spider’s body. Cephalothorax (prosoma) contains the brains, jaws, eyes, stomach and leg attachments. Abdomen (opisthosoma) contains the guts, heart, reproductive organs and silk glands. Eight Legs are attached to the cephalothorax. Each leg has seven segments and is tipped with claws. Spinnerets (silk glands) spin silk which many spiders use to make their webs. Fangs inject paralyzing venom into their prey. Only a small number of spiders are poisonous to humans,e.g., the black widow. Eight eyes are typical for many spiders. Some have six or fewer eyes. Despite the number of eyes, they rely more heavily on their other senses, e.g., touch and taste. Pedipalps are a spider’s two feelers. They function much like our arms but sometimes look like legs. Pedicel is a spider’s waist. In order to receive full credit on her spider project, she needed to label the above body parts. The diagram below will assist you with those body parts you may not be familiar with. Completing projects, like the above Halloween activities, helps a child grasp concepts in a creative way. As parents, we like to help them create a “perfect” project. Remember this your child’s project so guide her and offer assist when needed but make sure she is making the craft.